Over the last few years, the internet has evolved to become the hub of our digital lifestyles and will entrench itself more and more firmly at the heart of our everyday lives. 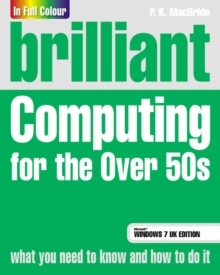 Focused specifically on the needs of those whose working lives were not affected significantly by the World Wide Web and email, this book provides an introductory guide to using the internet. 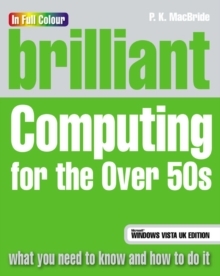 Whether you're getting in touch with far-flung relatives, accessing the latest news, doing the weekly shopping, buying concert tickets or booking your next holiday, Brilliant Internet for the Over 50s shows readers how to find and efficiently use the best and most relevant websites, programs and services. Brilliant step-by-step guides, expert tips and tactics will make sure that when it comes to using the Internet, readers are constantly one step ahead of the game, accessing the rich resources that are on offer safely and easily. Fully updated to cover the new features of your MS Windows 7 PC or laptop and using IE7, this book also includes new coverage on blogging and podcasting as well as enhanced coverage on digital photography and music. 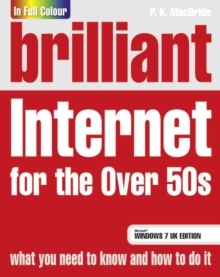 Brilliant Internet for the Over 50s provides: A visual tutorial taking you from Internet novice to accomplished user in easy steps. A guide to enhancing your life from the comfort of your own home, from staying in touch with scattered friends and family , to research, planning travel routes or doing errands such as banking & shopping. Spend less time reading and more time doing with a simple step-by-step approach.